Lush lawns, shady maple trees, a pleasant outdoor patio, and expansive playing fields give Cardozo the feel of a suburban high school. Some students choose it over Bronx Science or Stuyvesant, saying it offers comparable academics in a somewhat less intense, less competitive atmosphere. Cardozo requires four years of science and four years of a foreign language. Students are strongly encouraged to take four years of math. An unusually high proportion of students take Advanced Placement courses. In fact, the College Board in 1997 ranked it twelfth of 12,002 schools in the nation in the ratio of graduates to AP exams taken. The social-studies department houses the "mentor law and humanities program," designed to carry on the ideals and traditions of Supreme Court justice Benjamin Cardozo, for whom the school is named. In their junior and senior years, students in the law program take courses in constitutional and civil law and work as interns at law offices, with local politicians, or in police stations. 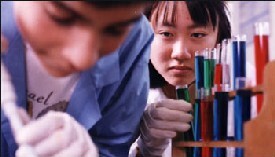 The school's selective DaVinci Science and Math Institute offers students the chance to conduct original research. "We have the opportunity to do cutting-edge research on equipment that colleges would be envious of," says Dr. Dean Saghafi, who heads the biology-research department. And because the DaVinci program is small -- with only 100 kids in each grade -- students have a chance for a lot of individual attention. The size of the school makes it able to offer a wide range of extracurriculars. There are 28 athletic teams, including basketball, soccer, gymnastics, tennis, baseball, lacrosse, and bowling. "For kids who aren't really into the team sports and aren't too athletic, we have yoga, we have salsa, fencing, and volleyball," says one teacher. How hard is it to get in? All students who live in the zone for Cardozo are automatically admitted. Students from anywhere in Queens may apply to the specialized programs for either ninth or tenth grade. The DaVinci Institute is highly selective, with more than 2,000 applicants for 100 seats. The law program accepts students according to a formula designed to balance the number of high and low achievers. The dance program accepts students by audition (about 600 students apply for 100 seats). Downsides: More than 4,000 attend classes in a building designed for 2,500. Scheduling is such a nightmare that class rosters are rearranged two or three weeks into each semester as students are shifted from oversize classes to ones that have fewer students. Guidance and college counseling: Parents praise the staff of the college admissions office, but acknowledge that there is little opportunity for individual attention because of the size of the graduating class -- 1,000.